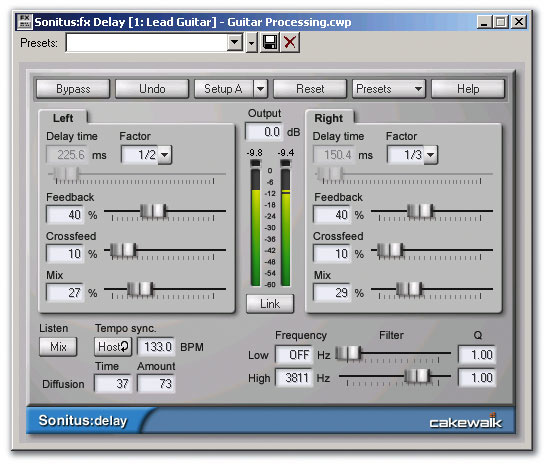 Sonar offers several tools that can be used to help you create a polished guitar sound. There's even a built-in tuner! The technology for easily achieving an expensively produced effect when recording guitars is becoming more and more accessible. We take a look at what Sonar has to offer in this department, and also examine other tools for creating killer guitar sounds. In the early days of sequencing, guitarists were pretty much left out in the cold. But that's changed over the years, as audio recording became integrated into software, and guitarist-specific hardware and plug-ins appeared to make sequencing simpler. This month, we'll cover general guitar recording topics as they relate to Sonar, and take a look at several Sonar-specific techniques. Mic an amp, or use a DI box (or both), and record the guitar as you would any other miked or direct signal. Record directly into the computer, using amp modelling and similar plug-ins to create your sound inside the software. 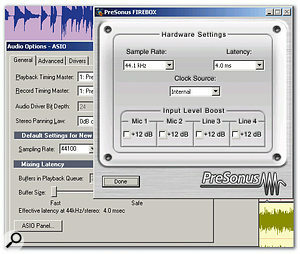 Combine the two: record from an amp but also do re-amping or other processing (for specific information on re-amping, see the May 2003 Sonar Notes column at www.soundonsound.com/sos/may03/articles/sonarnotes0503.asp). If you often use mics, you probably already have a suitable interface/preamp combination that can also accept a DI box's output. As this is pretty standard recording practice (unlike feeding a guitar directly into your computer), there are no particularly special issues to consider. However, those who prefer to record both a miked-up amp and a direct signal can use Sonar 's facilities to correct time or phase differences between the two signals. Any differences occur because the direct signal hits Sonar instantly, whereas the miked signal will hit later, depending on distance from the sound source (the delay is around 1ms per foot). Click on the miked clip and drag it forward until the waveforms line up. Use the Nudge feature. Go Process / Nudge / Settings, and for one of the Nudge Groups select 'Samples' as the units (see screen on right). There's a choice of three Groups and I arbitrarily decided to use Group three for this task. I chose a Nudge value of 10 samples. The different Groups have different default keyboard shortcuts; for Group three you nudge forwards via the numeric keypad's '7' key and backwards via the '9' key. The last method has two disadvantages: you can't enter amounts in samples and there are no default keyboard shortcuts. The advantage is that as you can enter values in ticks (which gives sufficient resolution). If you record with a consistent mic position, once you figure out the right amount of slide you can just enter the amount in ticks and you're done. If you record through a guitar preamp or hardware modelling device, you perfect your sound using that, then send it to any convenient line input your computer may have. 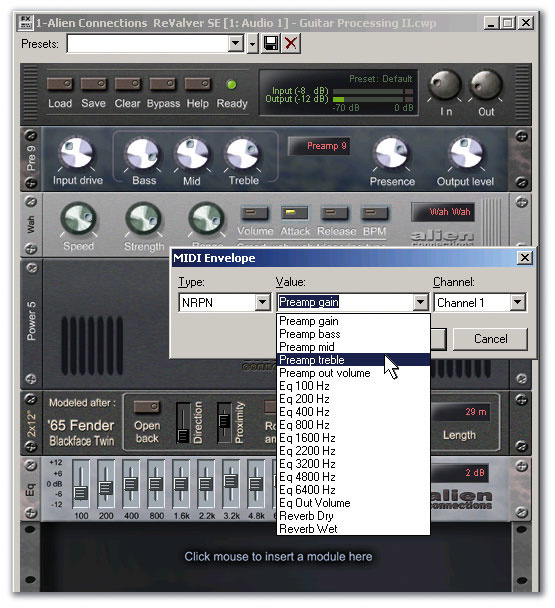 Feeding your guitar output directly into the computer is another matter entirely, as conventional line inputs will load down the guitar (reducing highs and level), while a mic input will probably have too much gain and contribute noise. One solution is a standard audio interface with a high-impedance input designed specifically for guitar. Most modern interfaces provide this option, but there are also more guitar-centred interfaces. For example, Native Instruments' Guitar Rig and Waves' GTR offer hardware interfaces that buffer your guitar signal, then feed into a standard line-level audio interface input. Guitar Rig 2 and IK Multimedia's Amplitube 2 guitar modelling setups go one step further, offering hardware interfaces that plug directly into your computer via USB. 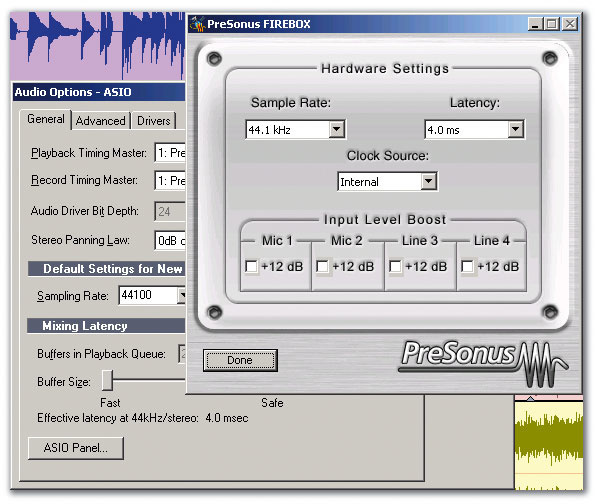 The Presonus Firebox, which has a 1MOhms input impedance suitable for guitar, has been set for 4ms of latency. This value is reflected in Sonar's Audio Options dialogue box. 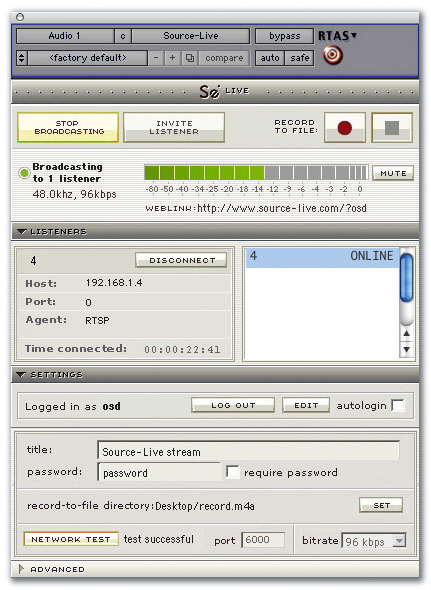 Although I've been able to obtain lower latencies, 4ms is fast enough to give a good feel while playing guitar and still allow the CPU some breathing room.These products use plug-ins to shape the guitar's sound, so you need to monitor through Sonar itself, which brings up the issue of latency. As Sonar has two low-latency driver options (ASIO and WDM), you can try both (if available), to determine which produces least delay. Around 10ms of latency is about the most I can handle; 5ms is acceptable. WDM first profiles your interface and chooses a relatively conservative latency setting. From there, go Audio / Options / General and experiment with the Buffer Size slider until you find the best compromise between minimum delay and greatest reliability. 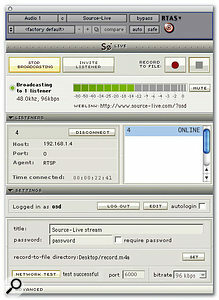 In the case of ASIO, there will be an ASIO control panel for your interface that sets the basic latency, in samples or milliseconds (see screen right). Sonar locks to this value; you can't change buffer size using the Options / Audio dialogue box. Thanks to fast computers and efficient drivers, it's often possible to obtain latencies lower than 3ms, but the figure you achieve will depend on interface, drivers, computer speed and how much you're asking the computer to do. If you're overdubbing after soft synths have been added, freeze their tracks before recording guitar. You'll be able to reduce latency as a result, as the CPU won't have to work as hard. Digitech's guitar workstation line (for example, the GNX4) and M-Audio's Black Box combine signal processing with a USB interface, while the Line 6 Toneport series provide guitar and mic interfacing but also include onboard DSP with the famous Pod lineage, which you can program from your computer. With these options you create the sound you want before the signal hits the computer, so you can monitor the device output; there's no need to listen through Sonar (unless you're adding more plug-ins within the program), so latency isn't an issue. If you find any latency whatsoever annoying, this approach is probably best. Cakewalk's Rapture virtual instrument is now shipping and, like Dimension Pro, is available for Mac OS as well as Windows. It's a pretty potent synth that combines lots of step-sequencing options with synthesis techniques, to create a novel instrument that's extremely well-suited to dance material. How does it compare to Dimension Pro? In short, Dimension Pro is closest to a traditional sample-playback synth, albeit with extensive, imaginative programming options. Rapture is more of an 'instrument', in the sense that it creates new types of sounds with a wavetable base. Both complement each other well and are clearly a serious effort on Cakewalk's part to become a player in the crowded software synthesizer market. Sonar 5 comes with two plug-ins designed specifically for guitar: Alien Connections' Revalver SE (found under Soft Synths) and Amp Sim (under Audio Effects). 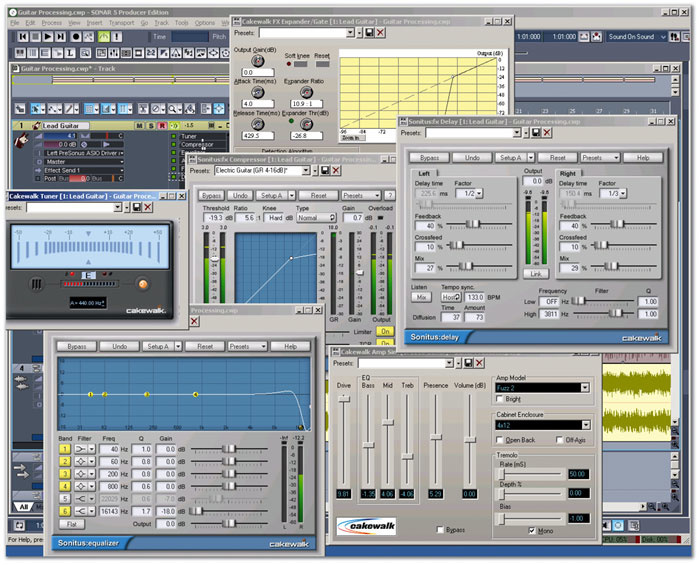 While these plug-ins don't have the flexibility of specialised guitar modelling software, they're a good way to get started. 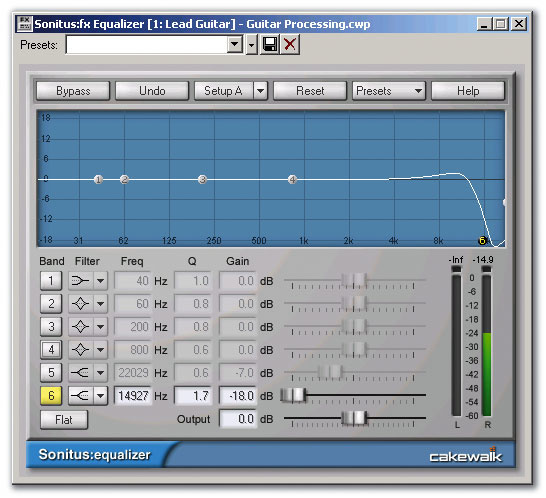 Inserting Cakewalk's EQ before and after the distortion effects can also go a long way towards tailoring the sound. For example, if you remove some high frequencies before hitting distortion, the timbre will be smoother and sweeter. The Compressor, Delay, Modulation, Reverb and other bundled effects can also be pressed into service. One of Sonar 5 's highly useful features is Track Templates, which allows you to put together a 'rack' of effects in a track, then save it for later recall. Let's go through the process of creating an effects rack for lead guitar, using the included Sonar effects, then save it as a Track Template. 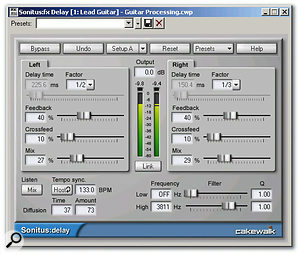 As a bonus for SOS readers, the Track Template (called template.cwx), and an MP3 demo file of some typical guitar playing using the patch, are available at www.soundonsound.com/sos/sonartech/template.cwx and www.soundonsound.com/sos/sonartech/demo.mp3. In this patch, the EQ is set up as a high-cut filter to reduce potential harshness caused by distorting high frequencies. 1. As Sonar includes a chromatic tuner, we might as well take advantage of it to keep everything in tune. Start off by right-clicking on the effects bin and going Audio Effects / Cakewalk / Tuner. You can mute the tuner by clicking on the button above the Cakewalk logo, or let the signal pass through. I just leave it on all the time so that I can tune a string whenever needed. 2. Compression is a good effect to place right after the tuner, as you can smooth out the dynamics and increase sustain prior to feeding the distortion. The Sonitus Compressor 's Electric Guitar preset is, not surprisingly, a good place to start. But I drop the threshold much lower for more sustain, and bump up the output level a bit. 3. Next up is the Sonitus Equaliser. The purpose of this effect is to shave off just the highest part of the spectrum, as distorting this region can create a harsh sound (see screen above). The Sonitus EQ has the useful ability to change the Q for the high-frequency shelf, thus making the shelf steeper, but also adding a slight response bump at the cutoff frequency. This can work very well with guitar, to give more definition in the upper mid-range if you've pulled the high frequencies back a bit. In this particular patch, the EQ doesn't have much effect on the sound, but the track template is designed to be somewhat general-purpose, and there are times when I use this EQ to boost the mid-range a bit (making those frequencies more 'touch sensitive' when they hit the distortion stage), roll off more high end for a mellower sound, or trim the bass when I want a thinner rhythm guitar part. 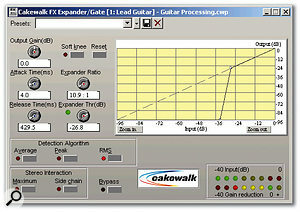 The Expander/Gate is a useful module for keeping noise under control. This is especially important because the use of heavy compression early in the signal chain tends to bring up any low-level noise. 4. Next, the guitar signal hits the distortion stage. Cakewalk's Amp Sim is neither the most versatile nor best-sounding amp simulator on the planet but, like all of these devices, it has its own sound that can be a useful addition to your toolkit. I like to push the Drive control up a bit, as Amp Sim works better on light or over-the-top distortion; like many distortion modellers, it has more trouble achieving that 'just on the edge' sort of bluesy distortion. Boosting the mid slightly and cutting the treble gives a rounder tone. Of course, all is greatly influenced by the Amp Model and Cabinet Enclosure you choose. 5. 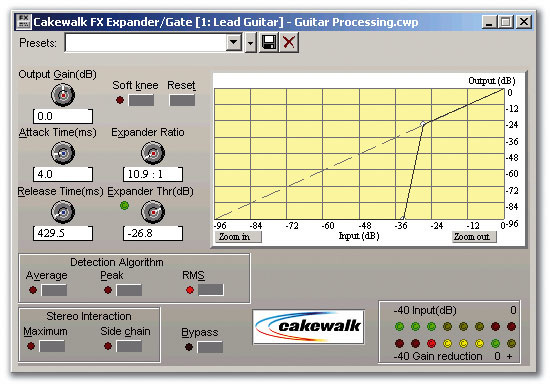 The Cakewalk FX Expander/Gate (see screen right) follows the distortion, to control noise. You probably don't want a huge expansion ratio; I'm willing to trade off a little low-level noise for a more natural decay. 6. I'd normally follow distortion with another stage of EQ, but the controls in Amp Sim do pretty much what I need them to do anyway, so the signal goes directly into the Sonitus Delay (see top screen overleaf). This wraps a little ambience around the guitar, as well as spreading the currently mono signal into stereo. One of my favourite techniques is to sync delay time to the host tempo, with one channel set to a factor of 1/3 and the other set to 1/2, a fair amount of feedback (say, 40 percent) and a mix around 30 percent wet. The overall sound is spacey and large, but also fairly tight, because I reduce high frequences starting at about 3800Hz. Thus, the main guitar signal doesn't have to compete with the echoes, which are duller. Alien Connections' Revalver SE uses a rack metaphor and allows you to insert and remove modules from the rack. While it's basic, it can produce some decent rhythm guitar sounds and leads. Unfortunately, it currently doesn't work with the 64-bit double-precision engine; you need to untick that option under Options / Audio / General. It's also fairly noisy, but it can be controlled with careful knob tweaking and a little post module expansion or gating. The knobs are fiddly to work with, but there's a shortcut: double-click on a knob and an easy-adjust slider appears. The SE version offers two preamp models (Pop and Gentle Valve), two power amps (Hard Rock and Blues), four effects (Trimpot with volume and meters, 9-Band Graphic EQ, Stereo Reverb and Auto Wah) and three cabinets (1x8, 2x12 and Powersoak). Of the two preamps, I find Gentle Valve easier to tame, and it produces satisfyingly chunky sounds. Surprisingly, it's also capable of some very convincing 'on the edge of distortion' effects. Turning up the Input Drive seems to squash the sound a bit, as if adding compression, but if you go too high you'll probably end up with some rather unpleasant intermodulation-type sounds. Below: The 'rack' of effects towards the centre of the screen is being saved as a Track Template for later recall. The Pop preamp provides more distortion and seems a bit noisier. The key to producing good sounds is to spend some serious time tweaking the Tone and Presence controls, as they make a huge difference to the overall sound and interact with the Input Drive control to some degree. Of the two power amps, the Blues one has the greatest effect, giving a quality not unlike some of the guitar sounds on early Yardbirds' records. You'll also want to add a speaker cabinet to your setup, and here's where you'll find Revalver 's secret ingredient: both cabinets have a room ambience button, and a companion button that loads one of 30 different room ambiences. Some of these are a bit much, but overall they provide a useful accent to the amp sound and help it to sit comfortably in a track. There are also two useful miking controls: Direction (edge, middle or voice coil); and Proximity (1-100 cms). Incidentally, don't ignore some of the presets because they may initially seem inappropriate; for example, I like how the 'Fat Drums' ambience sounds with guitar. Revalver SE responds to NRPN-based automation envelopes in Sonar. Of the effects, Trimpot's main value seems to be creating ear-splitting feedback if you use the normalise function, so I'd advise against it. In any case, the preamps have output controls you can use to set the level through the chain. 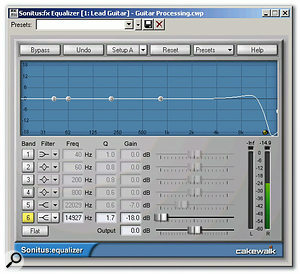 The 9-band Graphic EQ is useful to a point, as it only goes up to 6.4kHz. The Reverb is actually quite tasty and CPU-friendly, providing a funky sound that tops off the rig nicely. Finally, the Auto-Wah is a tempo-controlled wah-wah effect, but with a twist: the tempo can sync to the host tempo, or can be altered by the instrument's volume, attack or decay characteristics. For example, with volume selected, playing louder causes the wah to speed up; with decay selected, the tempo starts out fast, then slows down as the signal decays. Other controls set the wah strength and range. Create a MIDI track and assign its output to Revalver. 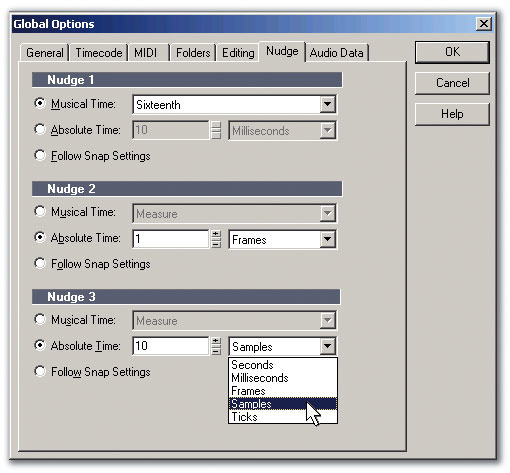 To create an envelope, right-click in the MIDI track and go Envelopes / Create Track Envelope / MIDI. Under MIDI Type, select NRPN. 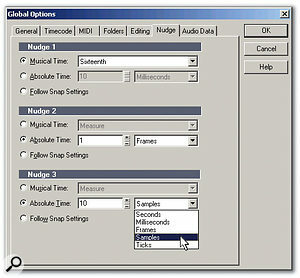 Under Value, select the parameter you want to control and a corresponding envelope will be created within the MIDI track (see screen right).